Long-time customer Richie Whitmore and his TITANIC 14lb 1oz Rodman Reservoir BEHEMOTH! This fish was one of 3 bass Mr. Whitmore caught over 10 pounds on that 3 day trip with us along with 10lb 10oz and 11lb 9oz HAWGS!! Adam Evans and crew had one AMAZING trip! One cast before this one his partner landed a GORGEOUS 10lb 9oz BEAUTY! While we were celebrating, Adam cranked down and set the hook on this HAWG BEAST that tipped the scales at 13lbs and a couple ounces!! 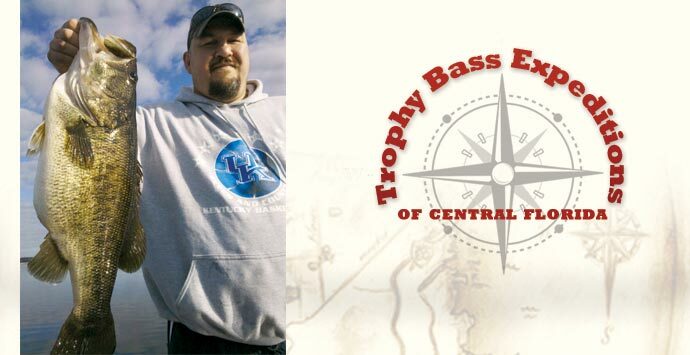 The Eley and Kelley party boated 51 bass with us on a January trip!! The largest 5 were 7lbs, 9lbs, and these 3 lunkers that were all 10lbs and over!! 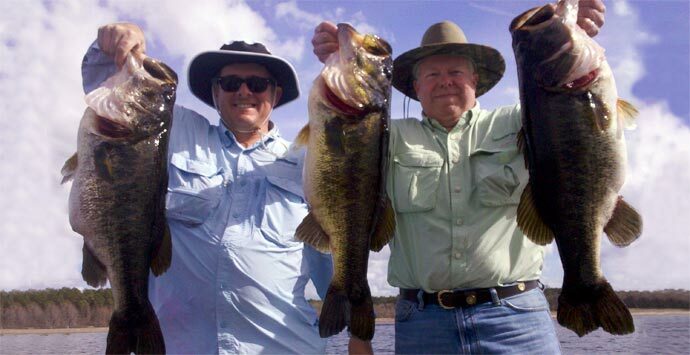 While we fish many great fishing destinations around Florida, we specialize as a Rodman Reservoir Bass Fishing Guide Service. This legendary body of water has been named by nearly every publication imaginable as one of the top trophy bass fisheries in the world. It may also be one of the most beautiful. On a frigid February day the Cousin and Delisle parties boated a whopping 97 bass!! Which included fish weighing7lbs 4oz, 7lbs 8oz, two at 8lbs, 8lbs 10oz, 9lbs 4oz, 10lbs 1oz and topped by Mr.Cousin's 10lb 10oz beauty!! 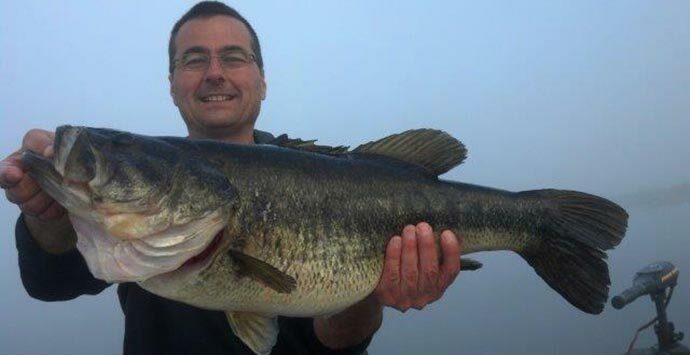 Here is a photo of customer Randy Crabtree and a gorgeous 12lb 2oz bass!! One of over 60 fish the Crabtree party boated with us on a super half day trip!! Pictured above are the four largest fish from the Taylor party. They were 7lbs, 8lbs 12oz, 9lbs 8oz and a beautiful 12lber and were four of 50 fish boated that day. Here is picture of big fish of the day for the Boyd Party, she weighed in at a healthy 11lb 2oz and was one of 67 bass boated that day!! They also boated fish weighing in that day at 7lbs 8oz, 7lbs 12oz, 4 fish at 8lbs, a 9lb 10oz, and 9lb 14oz!! 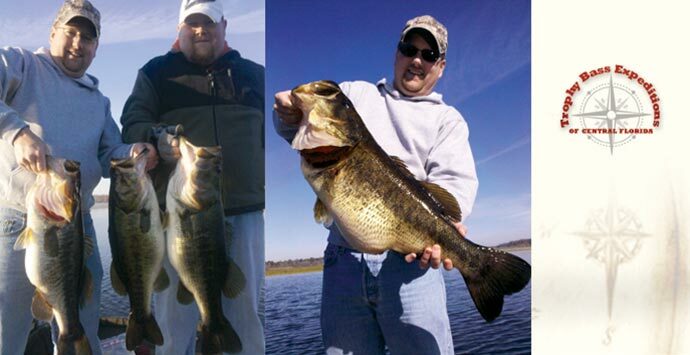 The Only Florida Bass Fishing Guide With 3 TrophyCatch Florida “Hall of Fame” 13 + Pound Customer Catches! Honored In The Prestigous B.A.S.S. 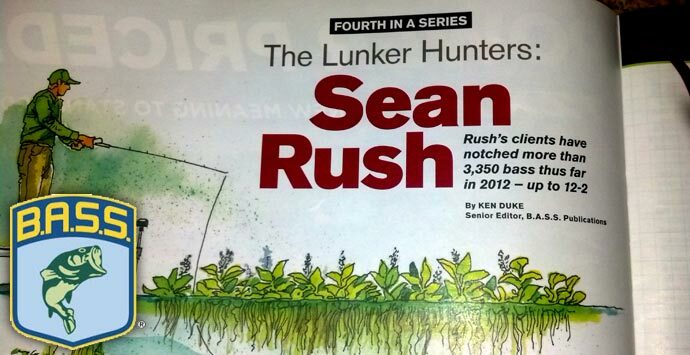 Lunker Hunter Feature Articles As Giant Bass Specialist! 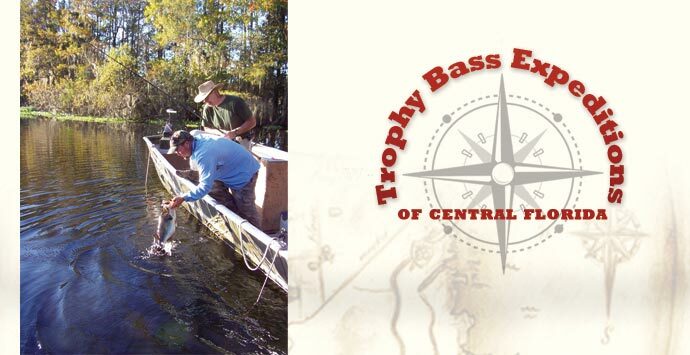 Welcome and thanks for visiting Trophy Bass Expeditions of Central Florida! We are located in Ocala, Florida in the "Bass Capital of the World" section of Marion and Putnam Counties in North Central Florida. 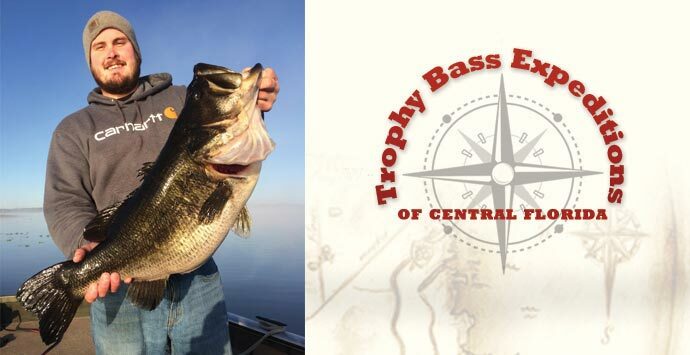 We specialize as a Florida Trophy Bass Fishing Guide Service on the following world famous fisheries: Rodman Reservoir and the adjoining Ocklawaha River between Ocala and Palatka, Florida. The St.Johns River from Astor to Jacksonville, Florida including Lake George. The Suwannee and Withlacoochee Rivers on the western side of the state. Orange and Lochloosa Lakes and the surrounding waters of Gainesville, Florida and numerous other Ocala National Forest and Florida waters. My name is Sean Rush and I am a FULL TIME USCG licensed and insured Florida Trophy Bass Fishing Guide with over 29 years guiding and 39 years angling experience on these remarkable waters. I am blessed to operate perhaps one of the busiest Florida Bass Fishing Charter Services and am on the water over 300 days per year! I average between 300 and 340 guided bass fishing charters per year which is more than triple my closest competitor on my home waters. So by choosing my guide service you get unmatched time on the water and hyper accurate knowledge of water conditions that my competitors simply can’t provide. My specific area of specialty comes as a Rodman Reservoir Trophy Bass Fishing Guide. 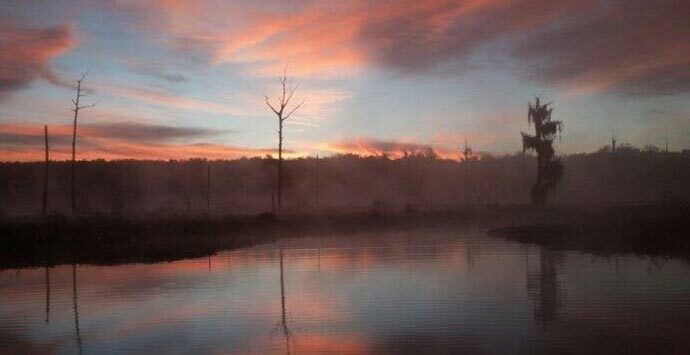 Legendary Rodman Reservoir has for decades been deemed by every bass fishing publication and authority imaginable as one of the top trophy bass lakes in the world. I believe this lake gives an angler of any skill level perhaps the best shot of landing a hulking 10 pound plus bass! Perhaps the best chance anywhere. 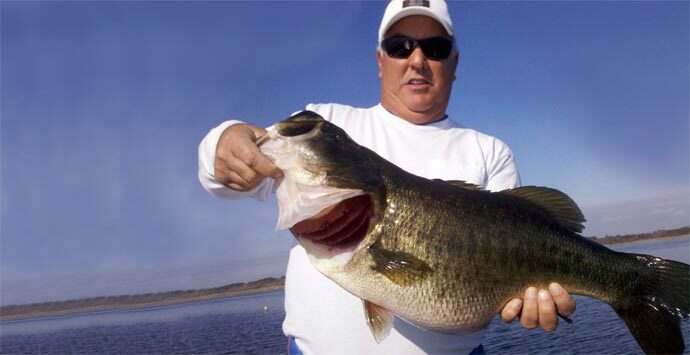 The large number of giant Florida largemouth bass landed here annually seems unmatched. 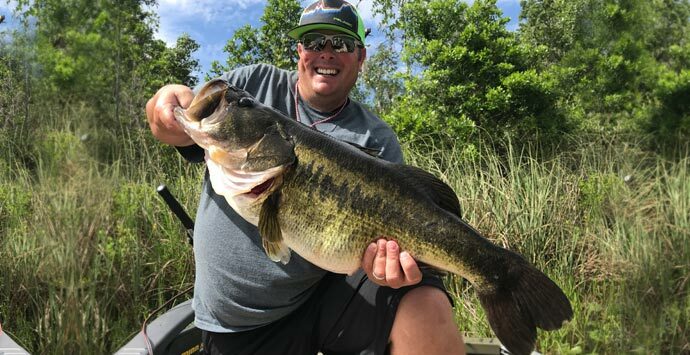 From the 17.23 pound bass caught by a Virginia fisherman in 2000 which nearly clipped the official state record, to the numerous 16 plus pound bass landed by local anglers, your next cast could literally be that fish of a lifetime! BOOK WITH ME AND YOU WILL FISH WITH ME! We are NOT a guide referral service. Please visit our "Important Tips to Consider When Selecting a Guide" page for some helpful hints on guide selection. My headquarters are centrally located roughly less than 60 minutes from Jacksonville and Orlando and a mere 40 minutes from Daytona Beach, Gainesville and The Villages in the heart of Florida's horse country. 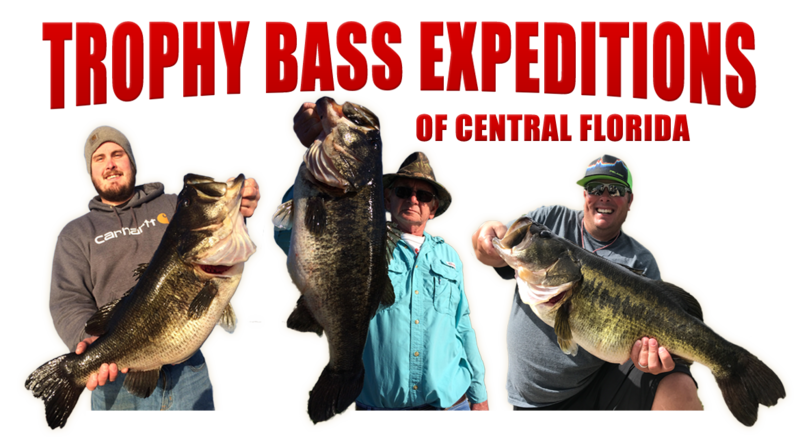 This locale offers both our in state and out of state clients access to what is unquestionably some of this country's most legendary bass fishing! The area offers a unique old Florida charm and beauty, accompanied by American Bald Eagles, Osprey, Alligators, Manatee and too many aquatic waterfowl and fish species to list here. Perhaps best of all it is far removed from the noise and traffic of a bustling city. So whether in Jacksonville or Orlando on business or vacation, in Daytona for one of the many nationally prestigious events, or just trying to decide on which Florida Bass Fishing Guide Service to choose to catch that trophy bass of a lifetime, why not choose Trophy Bass Expeditions of Central Florida for a truly memorable fishing experience on some of the states most pristine and spring fed waters! 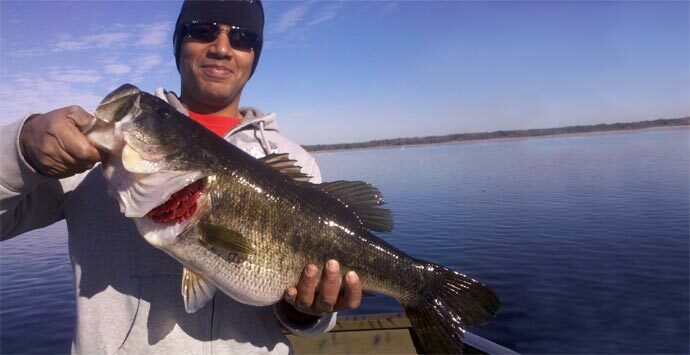 Dewight “Richie” Whitmore, 27, from Georgia, caught, documented and released a 14-pound, 1-ounce Florida largemouth bass at Rodman Reservoir while fishing with Capt. Sean Rush. We can accommodate any size fishing parties. From large multi boat corporate trips to single anglers. Families and children are always welcome! We can assist you to arrange some of the most amazing lodging! From modern urban motels in Ocala or Palatka to rustic lodging with stunning bluff views overlooking Rodman Reservoir. We can meet your needs no matter what your preference. You can also rest assured with our "No Fish-No Pay" policy that we are confident in our ability to place you on the right body of water at the right time to insure you have a memorable trip! So call or e-mail and Book-A-Trip today and lets go make some memories!